Thread earrings are beautifully crafted by hand with the most exciting colors sometimes it’s hard to choose which pair or pairs you like the most. 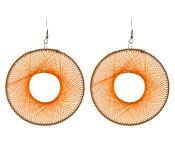 Whether you have long hair or short hair these thread earrings make a statement. The slightest hint hidden in long hair or a big expression of colored thread against the skin of a short hairdo, both will do beautifully…as will you. All our Teardrop Thread Earrings are handmade in Peru. Each earring is hand woven and made with a personalized touch. Woven thread is delicately strung through a teardrop silver frame. Choose your favorite colors and make the style your own! Thread Earrings are a new fashion trend that adds an exotic touch to your casual t-shirt and denim jeans, your favorite sundress or cocktail wear. String Earrings come in so many different colors and sizes they have quickly become a versatile earring choice. Whether you call them Imperial Thread Earrings, String Earrings or Teardrop Earrings, there is no denying these earrings are unique and sure to draw compliments. We can’t keep them on the shelves and it’s easy to see why. The colors are stunning and the designs are breathtaking. 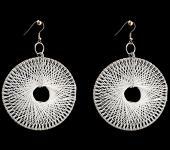 Thread earrings are the hottest fashion jewelry item to hit the street this year. Featured in fashion spreads and runways across the world, these authentic Peruvian string earrings are the must-have item to top your lust list. String Earrings are available in a wide range of the hottest colors, from basic blacks and neutral whites, to funky blues and purples, and gorgeous red and oranges. You can mix and match your very colors to make a statement, or keep things simple with a neutral palette. If you're not too wild and crazy, try thread earrings in a monochromatic color scheme, like a variety of shades of blue. These colorful string earrings will work as an amazing statement piece to compliment your outfit. Wear bright blue thread earrings with a beautiful pair of navy ballet flats and you have a completed outfit in no time flat. Everyone will think you spent hours thinking about your outfit because you'll look so refined. If you ant to wear your Peruvian String Earrings for a special occasion, pull your hair back into an elegant updo and opt for subtle hues to accent your outfit. Beautiful monochromatic pastel blues add the perfect hint of color without going overboard. But don't think just because it's a fancy affair you're only option is subtle colors, add a pop of red or orange to your neutral black outfit. Deep red string earrings and a bright red bangle will look fantastic with your favorite basic black number. You'll stand out in the crowd and look refined and stylish. Fashionable string earrings are also the perfect way to try on one of the season's hottest colors, jewel tones. Deep purples and greens rule the runway this year and now you can get on board with this trend without making a big investment. If you're a girl who likes to spice things up a bit, go a little wild and opt for string earrings in a variety of standout colors. Try a beautiful pair of handmade Peruvian Thread Earrings featuring beautiful blues and reds intermingled, or opt for one of the season's hottest colors of apple green. These colors are sure to attract the right kind of attention, and draw the eye up to your face. These beautifully designed string earrings are a great compliment to nay wardrobe because they convey a sense of casual-cool and still look hot. The oversized styling of these earrings helps to elongate the face and add a touch of style no matter what the occasion. Wear your hair in an updo and add these earrings to make a fashionable statement, or opt for subtlety and wear your hair down and around your shoulders. As you move, these colorful gems will peek through our hair adding interest and a hit of something wild! With such great prices, you can stock up on all of your favorite styles and colors of these fabulous thread earrings. You won’t be disappointed and be prepared for all of the compliments you’ll get with your new and stylish look.